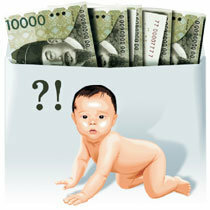 Childcare allowances of Gangwon Province. December. 06, 2018 08:21. mskoh119@donga.com. It has been quite some time since Korean society started to focus on overcoming low birthrate. The total birthrate Korea needs to maintain the current population is 2.1 children. Yet, Korea’s birthrate failed to exceed one child in the third quarter (0.95 child), following the second quarter (0.97 child) this year. Municipal governments, above all, are under imminent pressure as regions may disappear as a result of low birth rate. Municipal governments are introducing all kinds of projects to promote birth so that women will give birth in their regions. For example, you can receive 7 million won throughout five years upon giving birth to your first child in Bonghwa County, North Gyeongsang Province, which ranked first place in Korea for its fund to support birth. Bonghwa County will provide 10 million won to a family with second child, 16 million won to a family with third child, and 19 million won to a family with fourth family. The municipal governments, however, are facing an unexpected surprise; giving birth to a child in the region and living there is a separate matter. Population is actually decreasing in the case of Haenam County, South Jeolla Province, which maintained to rank first place in total birth rate for seven years ever since it conspicuously increased support fund for birth in 2012. According to a follow-up survey, it has been revealed that 43 percent of newborns in 2013 moved to a different place before the age of four. Although some criticize that such act is selfish, how can you blame them for seeking better childcare and education infrastructure? In this backdrop, Gangwon Province is pushing forward a stronger inducement strategy. The provincial government plans to pay 700,000 won of childcare allowance per month to children born within the province by investing 700.1 billion won in budget. Although this plan needs to go through the plenary session and obtain approval by the Ministry of Health and Welfare, the plan passed the standing committee of the provincial assembly despite controversies over its effectiveness. Each municipal government is coming up with such generous support plans but the causal link between monetary compensation and birthrate is uncertain. Research results even differ within the academia. According to a Japanese research paper last year, detailed childcare support is more desperately needed since the 1990s, rather than monetary support. A combination of different factors affect a couple’s decision to have a child. It is doubtful how many women will actually move to a region that provides support just because they are being provided with short-term monetary support. An improper diagnosis will only lead to an erroneous solution and thus, lies the danger of considering cash as the panacea for promoting childbirth.